Sometimes, commencement speeches are actually worth sitting through. Apropos of the season, NPR recently launched a website that collects some 300 of the most memorable commencement speeches dating back to 1774. I dove in searching for memorable speeches given by lawyers. All tolled, not too many lawyers made the list. Those lawyers who did, for the most part, are there for their accomplishments as politicians or business leaders, not as lawyers. Thus, Barack Obama, Bill Clinton and Gerald Ford all made the list. While all three are lawyers, they each also happened to be president of the United States. Life is not about warming yourself by the fire, life is about building the fire. And generosity is the match. To consider yourself – and to be considered – capable is good. To consider yourself – and to be considered – loving is even better. But to know yourself as generous is best of all. Generosity is its own reward. Another lawyer who made the list not for his legal accomplishments is Tim Russert, the TV journalist and long-time host of Meet the Press who died in 2008. He is there for a 2000 speech given at Niagara University in which he urged graduates to help children achieve a better quality of life. We can build more prisons and put more police on the streets, and we will. But unless we instill in our young the most basic skills and cultural values, we will be a very different society in the next century. We must motivate, inspire – yes, insist that they truly love and respect one another. The only Supreme Court justice who made the list is Warren Burger, for a speech he gave in 1983 at Pace University. Burger devoted his speech to urging reform of the nation’s prison systems. Our system provides more protection and more safeguards for persons accused of crime, more appeals and more reviews than any other country in the world. But once the judicial process has run its course we seem to lose interest. The prisoner and the problem are brushed under the rug. From my review of the list, I found only one lawyer there who who made his name not by virtue of political or business achievements, but through the actual practice of law. That was William Kunstler, the self-described radical lawyer who defended a who’s who of left-leaning clients over his long career. 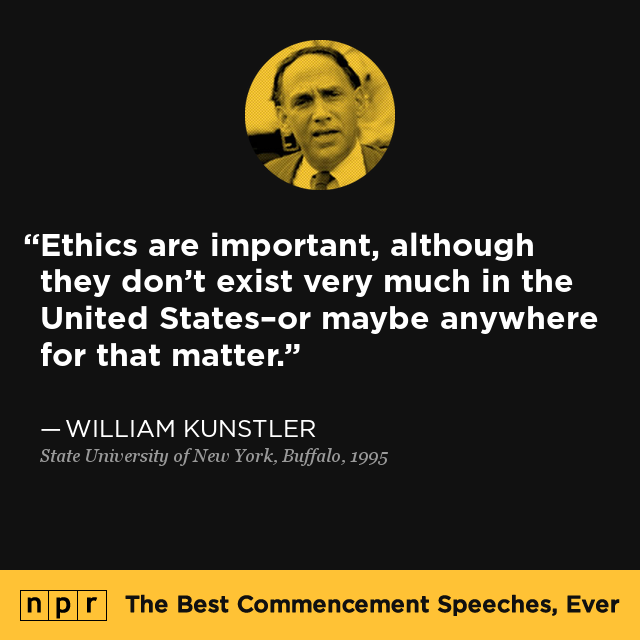 He spoke in 1995 — just a few months before his death — to graduates of the State University of New York at Buffalo. His topic was the erosion of civil rights and ethics in the United States and about challenging the status quo. The notion that you should try to overcome your weaknesses and force yourself to do what you’re not good at has never made a great deal of sense to me. It always reminds me of the scene in Blazing Saddles where the protagonist points a gun in his own head and marches himself off to jail to save himself from an angry mob.You can’t live holding a gun to your own head. Try and go with your faith.